Berlin doctors have captured the first ever MRI images of a baby being born. It's nice to know that the miracle of birth is just as disgustingly beautiful inside, as it is outside. The doctors at Berlin's Charité Hospital created a special "open" MRI scanner (most are tube shaped) to give the necessary room for the mother to do her work. The birth went swimmingly and the MRI scanner captured all the baby's little movements and strokes from womb to freedom. And before we all scream TMI, doctors swear that there are scientific reasons to see what's actually going on in there. 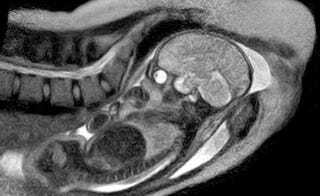 These live MRI images could prove vital in understanding the complications and pitfalls of the birthing process.